I recently taught a lesson on pan-balance equations. 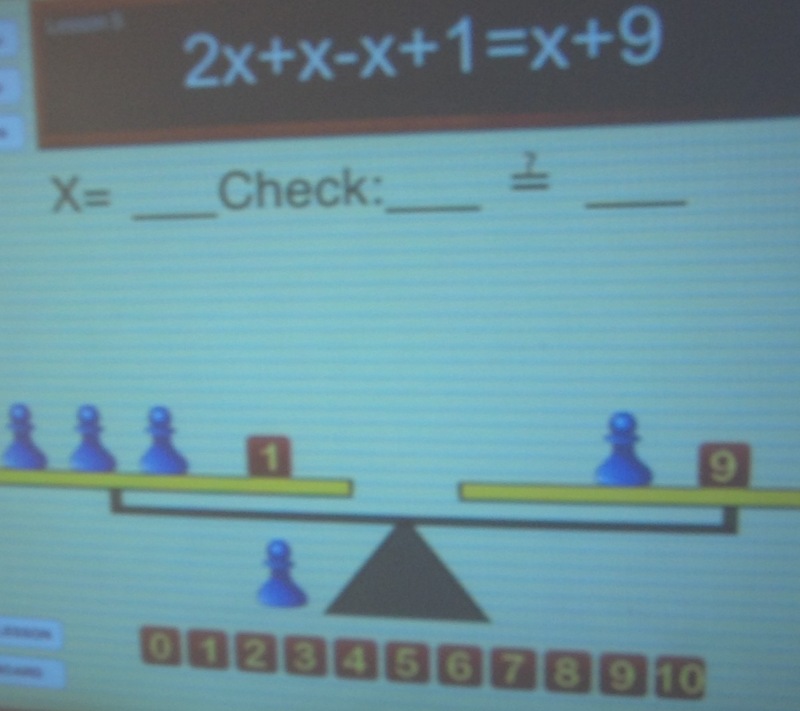 In my curriculum pan-balances are taught as a precursor to more in-depth pre-algebra. My students seemed to understand simple pan-balances and found that the balances (like an equation) needs to be balanced to work. The majority of students had no problem with questions (like these) involving oranges, apples, paperclips, etc. During the next lesson I introduced the idea of variables with equations, like 2x + 4 = 18. Students seemed to understand, but less than the first lesson. I brought everyone up to the classroom whiteboard and practiced many problems with the students. The students who understood always seemed to raise their hands, while students who didn’t completely grasp the concepts tried to blend in with the carpet. Students became less interested in what I was teaching when I started writing equations on the whiteboard. Unfortunately, I felt like I was losing a battle here. The more the students seemed to not understand, the more I felt the need for direct instruction. Near the end of the lesson around half of the students seemed confident to proceed to the next algebra lesson – solving for x on both sides of the equation. I had to change something. During the next day I decided to change up my instructional approach. I remembered back to when I first learned algebra and the confusion that I used to experience. My school memories of algebra started and ended by watching a chalkboard and overhead projector, as my teacher wrote and erased equations on the board. This was the only way to learn algebra, or so I thought back then. Using my experience I decided to change the instructional medium. I started my next algebra lesson with a quick review of pan-balances. Students seemed to gain confidence as we had a conversation about the importance of using algebra in careers outside of the classroom. We watched a quick BrainPop video on algebra and it’s uses. Instead of using the whiteboard again, I decided to take out the iPads. I already downloaded an app called Hands-On Equations a few weeks ago. The students were quickly motivated and I modeled how to use the app under the document camera. The class and I went through a few problems together until I thought they were ready to proceed. I allowed the students 20 minutes to explore the app and lessons. The students were expected to complete at least three lessons and reflect on their experiences in their math journal. What was interesting was that the students immediately took control of their own learning and utilized the app at their own pace. After hearing their responses and reflecting on the outcomes, I’m becoming more motivated to vary instruction to better meet the needs of my students. Varying the instructional approach can give students multiple opportunities to grasp concepts that can be particularly challenging. Your students may benefit from a bit of instructional change from time to time. ‹ PreviousWhat do Schools and Libraries Have in Common? Next ›How Do You Measure School Achievement? I love that you did this. I’ve used the Hands-on-Algebra manipulatives but wasn’t even aware of the iPad app. Very clever use of virtual manipulatives! Thanks for the comment. The students made many connections using the virtual manipulatives first. We moved onto the abstract today and the app definitely helped during the transition process. Your “takeaway” is important. You may wish to consider submitting a short article on your experience for a professional publication. Thanks. This is awesome! I love how you switched up your instruction and I love the authentic use of technology.